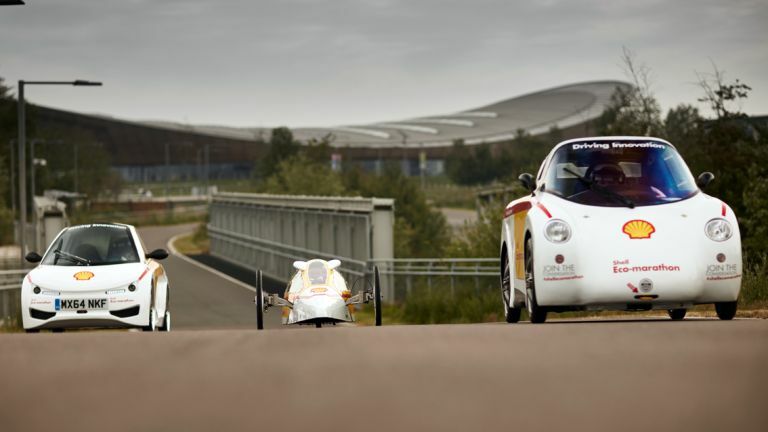 Part of Shell's Make the Future Live festival in London's Olympic Park, Stratford, the Eco-Marathon sees 170 university teams battle to be the stingiest driver IN THE WORLD. Technically this means seeing how far they can go on one litre of petrol (or its energy equivalent, in the case of electric, LPG and hydrogen cars). However, as that could take rather a long time – the current record holder for this event did the equivalent of 2,380 miles ('the distance between Paris and Moscow', it says here), and they never get much above 20mph – what they actually do is 10 laps of a one-mile course, using as tiny an amount of fuel as possible. Cars come in two classes: Completely Terrifying and Less Worrying But Amazingly Loud. The Terrifying ones are built entirely for aerodynamic efficiency and so are about an inch off the ground, with looks that vary from "Knocked up in a garage by a drunk" to "highly polished, but there's still no way I'm getting in it"
The "Urban" class look pretty much like Smart cars. The one I tried employed a one-wheel drive system, running off of a scooter transmission, with a fuel tank about the size of a quarter bottle of Scotch. As a result, it was the loudest thing I have ever been in, apart from the Batmobile. I wasn't sure the sheer loudness would come over in the video we shot. But as you can hear, it really did. Shell is also showing off an autonomous eco-car, built by Oxford Robotics Institute. I got to have a go in that too, and I've got to say, sitting as a car drives its damn self around a track, up hills and over speed bumps just never gets old. The sooner all cars are like this, the better..
To that end, next year will see a self-driving category added to the Eco-Marathon, so be sure to come down and see that – but maybe don't go too near the track. Make the Future Live kicks off on Friday night with Lates, 'a special after-hours event for over 18s'. Over the course of the Bank Holiday weekend you can then watch 170 teams compete in the Eco-Marathon, check out all manner of energy-saving stuff, eat food, drink booze, see celebs, enjoy 'weird science' demos, and listen to the musical stylings of popular songstress Alesha Dixon. Mmm-mm.